In June, the SEC initiated its examination of Apple's Form 10-K filing from September 2012 just shortly after the U.S. Senate's Permanent Subcommittee on Investigations had called the company's chief executive Tim Cook to testify about Apple's payment of taxes. America's intense government scrutiny of one of its most successful companies relates to the fact that Apple maintains vast overseas holdings that it will not repatriate into the U.S. because American tax laws would claim over a third of it. According to the LA Times, Congress drafted a report claiming that Apple was believed to have set up "a sophisticated series of international subsidiaries and tax strategies to cut its U.S. federal tax bill by $74 billion between 2009 and 2012." However, Apple's earnings have increasingly shifted from the U.S. to international markets, where its business is conducted from countries that have lower tax rates. The company's international operations accounted for 61 percent of its revenue last year, and increased to two-thirds of its revenue in the first calendar quarter of 2013. 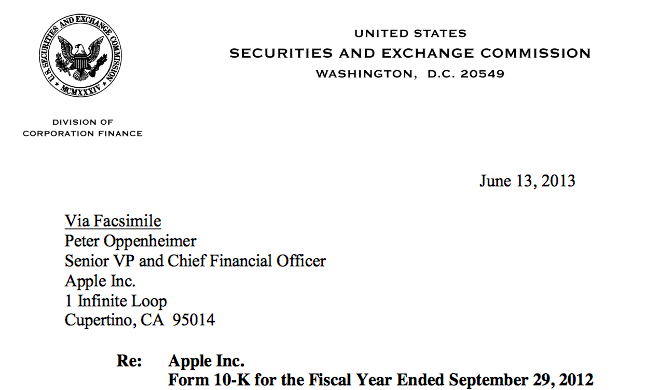 The SEC initially asked for more information about Apple's holdings on June 13. Apple responded, stating that "substantially all of the Companys $40.4 billion in undistributed international earnings intended to be indefinitely reinvested in operations outside the U.S. (as of September 29, 2012) was generated by subsidiaries organized in Ireland, which has a statutory tax rate of 12.5%." In other words, Apple's international earnings are held and taxed in Ireland, and the company plans to sit on them until they can be reinvested into its international operations. Cook had earlier told the U.S. Congress, "We pay all the taxes we owe." The company estimates that it will pay $7 billion in federal U.S. taxes this year. Move its intellectual property into offshore tax havens and use it to sell products back into the U.S. in order to avoid U.S. tax. Use revolving loans from foreign subsidiaries to fund its domestic operations. Have a bank account in the Cayman Islands. A variety of shareholders have been intently interested in collecting a cut of Apple's cash earnings, with many complaining that the company's cash is currently earning only very conservative returns. However, were Apple to simply distribute its cash holdings to shareholders, over a third would vanish during repatriation from U.S. taxation. Recipients would also be taxed on those dividends as investment income, resulting in an even greater net loss of value in the form of taxation. There would also be nothing left to hold up Apple's stock price, which the market has valued at very close to nothing above its actual cash pile. Wall Street remains baffled by Apple's business model of making products people want, rather than following Samsung or Amazon in selling large volumes at much lower (or zero) profits, a game plan many investors seem to consider more sustainable over the long term. In July, the SEC's primary response to Apple was that it should clarify that its "foreign" holdings were specifically Irish holdings. "Your responses state that your Irish subsidiaries generated substantially all of your $40.4 billion in undistributed international earnings, creating a tax benefit of approximately $5.9 billion in 2012," the SEC wrote. "Thus, it appears that you should specifically reference the potential risks associated with any changes in Irish tax laws." Apple responded, saying it would add references to Ireland and the potential for tax law changes in that country to have an impact on its operations. The company also clarified that its U.S. earnings were enough to fund its planned expenses, which would include capital investments in its Apple Campus 2 project, various U.S. Data Centers now under construction and retail expansions. The company is also funding massive stock buybacks and large dividend payments to shareholders using debt, essentially borrowing against the value of its cash to benefit shareholders without squandering its resources on voluntary tax payments it does not have a legal obligation to pay. The majority of Apple's domestic sales generate state sales taxes, are handled by retail employees who generate income and other payroll taxes, and have created one of America's healthiest and most prosperous new industries: mobile app development. App Store revenue is taxed domestically, both in end user sales and in the billions in income Apple pays out to its Mac and iOS developers. At the beginning of September, the SEC noted that it had completed its review and had no plans to take further action related to Apple's income and tax matters.